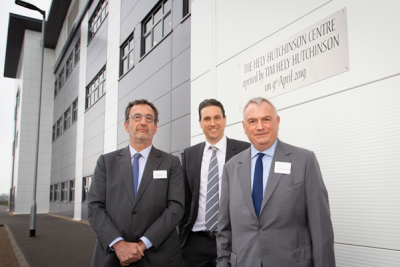 Hachette UK CEO David Shelley has opened the company’s new Hely Hutchinson distribution centre in Oxfordshire. The 23,000 sqm building, which Shelley described as ‘the best distribution centre in Europe, if not the world’, represents an enormous investment by parent company Hachette Livre. Shelley’s predecessor, former CEO Tim Hely Hutchinson, had announced plans to open the facility in 2015. ‘I am deeply honoured to have this named after me. Under one roof we have the best automated equipment in Europe, it is the culmination of a dream. The Hely Hutchinson Centre is the envy of the industry,’ said Hely Hutchinson. All publishers within the Hachette UK group and third-party publishers distributed by Hachette will be distributed from the site by the end of the second quarter of 2019. Currently the building currently contains 22 million books and can handle up to 500,000 books a day, dispatched worldwide by a staff of 350. Hachette’s old distribution centre Bookpoint, in the nearby town of Didcot, will remain in service as a bulk storage area for the Hely Hutchinson Centre.